Nepal is ethnically and topographically diverse. From belts of Terai to resilient mountainous region, different kinds of languages are spoken in this country apart from Nepali being the official language. There are 123 languages spoken as mother tongue reported in census 2011. 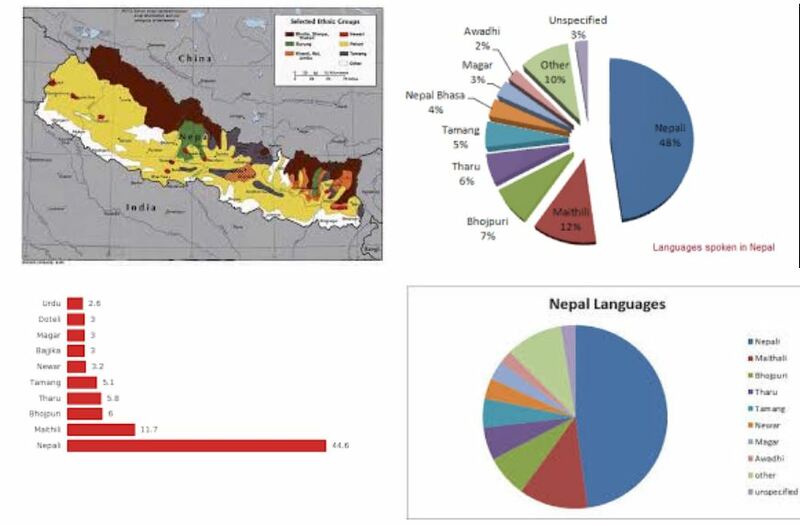 Nepali is spoken as mother tongue by 44.6 percent (11,826,953) of the total population followed by Maithali (11.7 % 3,092,530). – Central Bureau of Statistics (CBS). Here are ten languages widely spoken in Nepal. The demographic division is taken from (2011 National Census). Gurungs are the people from western region of Nepal. These hard working people mainly worked as mercenary for Indian Army and the British Empire during the WW2. The total number of Gurung speakers in Nepal was 227,918 (1991 Census). The Gurung language is a family of Sino-Tibetan Language, which means it is a part of more than 400 languages spoken in East Asia. Rai people are also from western region and they also served as mercenary for the British Empire and in the Indian Army. Rai Language is also a major family of Sino-Tibetan Language spoken in Nepal, Sikkim and Darjeeling Hills by Kiranti People. The Kiranti language is further divided into Chamling, Sunuwar, Bahing, Limbu, Vayu, Bantawa and few others. Terai is the main place from where people of Nepal depend its food from. The people there mostly comprises of Yadav People. The Yadav people were known as Ahir previously. The word itself is derived from the word Abhira’ which means immigrant tribe found in the inscriptions and in Hindu sacred books. They mainly use 3 languages in common (Nepali, Maithali and Bhojpuri). Muslims are not the natives of Nepal. Some of them were traders who arrived on their way to Kathmandu from Lhasa. More than 95% of Muslims in Nepal live in Terai and all of them speak Urdu. The community numbers 971,056 about 3.7 % of the total population of Nepal. Kami are the Indo-Aryan ethnic group. Kami speaks Nepali language but Kamis are scattered across all over hilly regions of Nepal, Sikkim, Darjeeling and Assam. Kami Acording to the census 2001 Nepal, there were 895,954 Kami in Nepal of whom 96.69% were Hindus and 2.21% were Buddhist. Tamang Language is the most widely spoken Sino-Tibetan language in Nepal. From 2001 census there are 1,213,500 Tamangs in Nepal. The youths and adults are bilingual whereas elderly, children are monolingual. The Tamang people use their language in Home, within friends, religion and they use Tibetan script. Magar language is also a family of Sino-Tibetan Language. The language is mainly divide into 2 distinct group (Eastern and Western). As per census 2011 of Nepal, Magar community represent 7.13% of the total population of Nepal. The two language have a large number of words in common but they have major structural differences and are not mutually intelligible. Tharu language is spoken by the Choudharys in Terai region. From the census 2011 of Nepal, there were 1,530,000 Tharu varieties of whom 28,500 were monolinguals. Tharu people use Devanagari script and these people follow Hindu religion. Tharu language is spoken within Tharu people. Newari Language is very common in the capital. Newari people are mainly from Bagmati zone and these people used Devanagari script for primary use and Newa script and Ranjana (Lantsa,Wartu) script for other purposes. Many women and elderly in Newar community are monolingual. Nepali is the official Language of Nepal. All the official documents comprises of Nepali Language. Nepali language is an Indo-Aryan language. Nepali language is also spoken in various parts of India. Nepali language shares 40% of vocabulary with Bengali Language. According to 2011 national census, 44.6 percent of the population speaks Nepali as the first language.